Russian experts largely feel that the offer of a stake in Yurubcheno-Tokhomskoye and Vankor would prove to be mutually beneficial for Rosneft and ONGC, and at the same time help the former secure a position in the Indian markets. Russian energy giant Rosneft recently made Indian state-owned company ONGC an unexpected offer to acquire stakes in two Siberian oilfields, nearly 49 percent in Yurubcheno-Tokhomskoye and 10 percent in Vankor. Russian experts largely feel that the offers would prove to be mutually beneficial for Rosneft and ONGC, and the same time help the Russian company secure a position in the Indian markets. “It's a bonus. A gift,” says Konstantin Simonov, Chief Executive of the National Energy Security Fund. By attracting a state-owned Indian company Rosneft is looking to expand its share in the Indian oil market, he adds. Mikhail Krutikhin, Partner at RusEnergy, somewhat agrees but is convinced that there are no economic grounds to these offers. “It is not clear why India would acquire equity participation in ‘stationary’ mining projects that do not need investments and development,” he says. “Moreover, a large part of their reserves are already sold to Chinese. Russia's offer is pure PR, intended to show the West that even under sanctions there is cooperation,” he adds. Who can come to the rescue of Russia’s oil industry? Vankor field is located in Krasnoyarsk region of Russia, and in the beginning of 2011 its oil reserves under ABC1+ C2 categories of Russian classification were estimated at 3.5 billion barrels (490 million tonnes). Yurubcheno-Tokhomskoe oil and gas field is the second largest project of Rosneft in Eastern Siberia after Vankor. 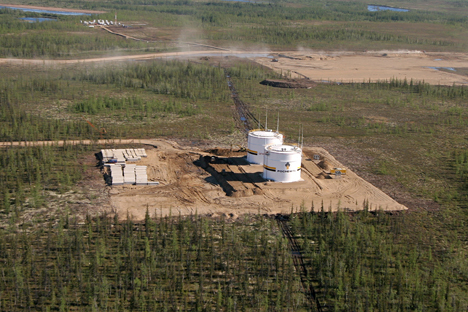 Its development began in 2009 and the reserves under C1+ C2 categories are estimated at 321 million tonnes. Oil production from these fields presents two challenges - the Siberian climate and the large gas cap over the oil reservoirs, says Oleg Dushin, the Deputy Director of the Regional Investment Company. According to him, the cost of production in such areas rises 2-3 times and is conservatively estimated at $22-25 per tonne. Both fields are export-oriented and produce high quality oil. Vankor oil has even been assigned its proper blend, notes Ivan Zavision, the Head of FOC Macroeconomic Forecasting Department. He is convinced that these fields can be quite attractive for the Indian company. They offer high quality oil, enough acceptable risks and would be a major accomplishment in the field of international cooperation between Russia and India. The expert believes that Rosneft's key interest today is to attract funds for promising projects. The sanctions have deepended this problem, triggering a more pro-active search for Asian partners. At the same time Zavizion doubts that this move of Rosneft was meant to counterbalance China in Russia's energy projects. «Most likely, major Russian companies are forced to diversify their risks, while politically establishing strong ties with India, China, and South Korea is equally important in the current situation», he said. Furthermore, the expert believes that strategically India needs Russian oil even despite having its problems fixed by Iran. «Russia is a reliable trading partner, not only in the oil and gas industry, so one can expect the Russian-Indian cooperation to grow in the near future», said the expert. Back in 2012, India confirmed its eagerness to develop the fields in Eastern Siberia and the Arctic at 33 and sometimes even 8 percent stake. This was despite a not entirely successful experience of developing the challenging fields in Tomsk region, Oleg Dushin noted. «Given the Tomsk experience, we can expect some bargaining over Yurubcheno-Tokhomskoye field. Vankor is a more desirable «piece of pie» for the Indians, but the share they get is smaller», he noted. Furthermore, to fracture formations in the Tomsk region, the Indians were collaborating with the American Halliburton and Schlumberger. Also they used their LLC Imperial Frac Services (50% ONGC and 50% the management) for hydraulic fracturing. «The results were not entirely satisfactory, even working together with the Americans. Indians are ambitious and they claimed their readyness to sign up for oil production challenges in Russia, which noone has ever mastered. That's positive», Dushin said. Chief Investment Officer QB Finance Dmitry Lepeshkin suggested that Russia's offer may help it strengthen its influence in Asia. As for India, considering the presence of Iran and other fuel suppliers in the region, India's participation in these projects is not vital in the short run, but collaborating with Moscow is very important in terms of diversification of supplies.